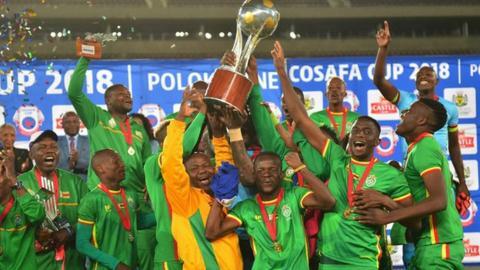 Zimbabwe has pulled out of hosting this year's annual southern African championship - the Cosafa Senior Men's Challenge Cup - less than a month since being awarded hosting rights. The tournament, which Zimbabwe has won for the last two years, is set to be staged from 19 May to 1 June 2019. Zimbabwe's sports minister Kirsty Coventry announced the news on Monday, saying "Zimbabwe will not be hosting Cosafa this year, the deal was not good for Zimbabwe or for Zifa [Zimbabwe's Football Association]." Zifa confirmed the decision, suggesting that the country would not have had enough time to prepare for this year's tournament. "We want to make sure that when we do host an event of this magnitude, that we are fully prepared, we have good timing. We just do not feel that that was really given to us this time around," said Kirsty Coventry on the Zifa website. "Moving forward, we will continue to work closely with Zifa in terms of what the next steps are and what the future holds in terms of hosting the event," Kirsty Coventry, a former Zimbabwe Olympic swimming champion, added. Zimbabwe won last year's Cosafa Cup in South Africa, beating rivals Zambia in the final. Zifa's president Felton Kamambo echoed Kirsty Coventry's sentiments about their hopes of hosting future tournaments. "As Zifa, our team will be participating in the Cosafa tournament, wherever it's going to be held. "We will try and bid for future hosting of Cosafa, that is maybe from 2021 going upwards, so that we have enough time, like the minister has said, to prepare to host this tournament," said Kamambo.